The Mount Vernon Independent School District has over 100 quotes stenciled on the walls of its public schools, and approximately seven of them reference Christianity or quote directly from the Bible. “Within the covers of the Bible are the answers for all the problems men face,” one quote reads, being attributed to former President Ronald Reagan. “It is impossible to govern a nation without God and the Bible,” another reads, being attributed to former President George Washington. The correspondence also contends that the historical quotes were either misquoted or manipulated, and were not true quotes. 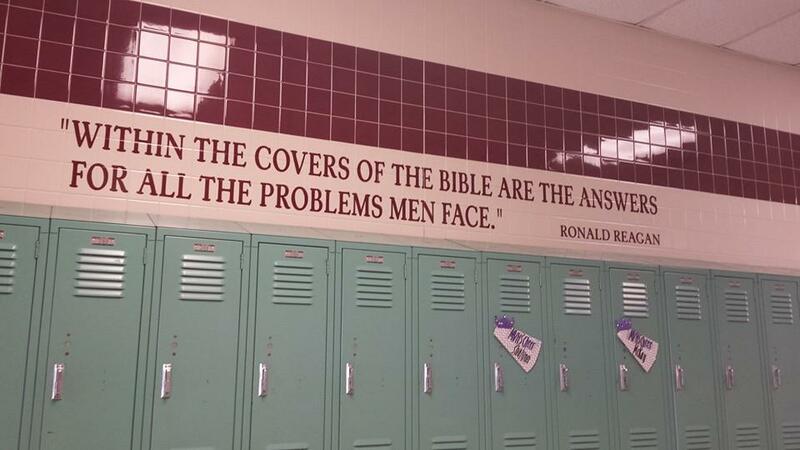 “The district cannot even fall back on the argument that these quotes have educational merit, given the many examples of misquotes, misattributions, and entirely fraudulent quotes displayed on its walls,” FFRF staff attorney, Sam Grover said in a statement. FFRF had also sent a letter to the district last October to complain about the quotes, and to demand that teachers remove “religious postings” from classrooms, including Bible verses or the display of crosses. As the district did not capitulate to its request, FFRF has now sent a second letter after investigating the matter further. As previously reported, a federal judge in Pennsylvania recently threw out a FFRF lawsuit against a Ten Commandments monument at a local high school, as it had sued on behalf of a mother and her daughter, who allegedly took offense at the display. U.S. District Judge Terrence McVerry outlined in his ruling that complainant Marie Schaub had only seen the monument two or three times. Her daughter—whose name has not been released—also testified that she didn’t pay much attention to the display while on campus. “Because plaintiffs lack standing, the court’s inquiry is concluded. The court lacks subject matter jurisdiction to address the merits of plaintiffs’ claims, and this action must be dismissed,” McVerry wrote.